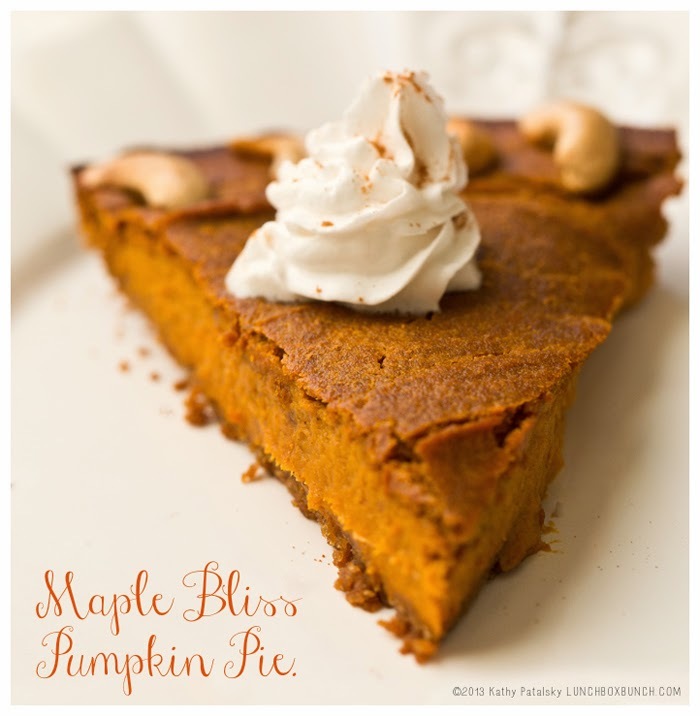 Even though I just posted 21 Pumpkin Pie / Pumpkin Pie-Inspired Recipes, I just had to post yet another spin on my favorite Thanksgiving dessert: Maple Bliss Vegan Pumpkin Pie. 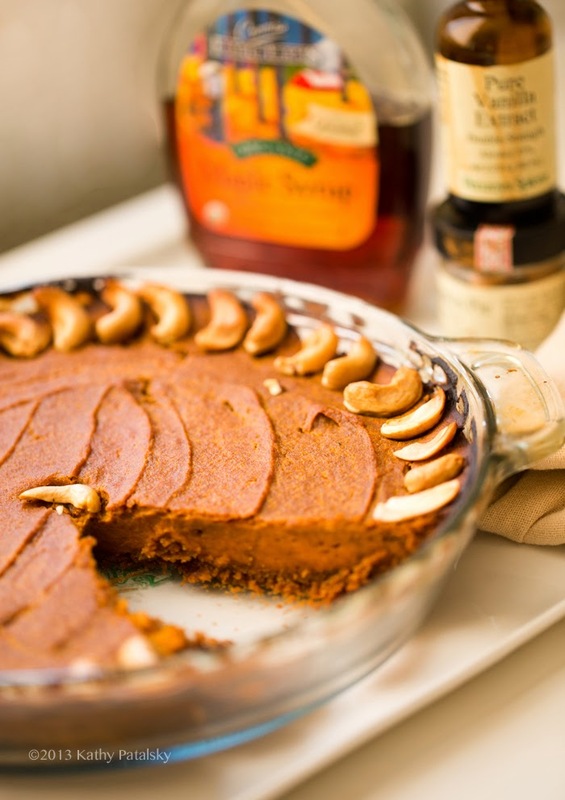 This delicious version includes copious amounts of grade B maple syrup as the sweetener. Maple syrup is pretty expensive so I only reserve it for special desserts as the sole sweetener. Thanksgiving is a very worthy day for that!.. 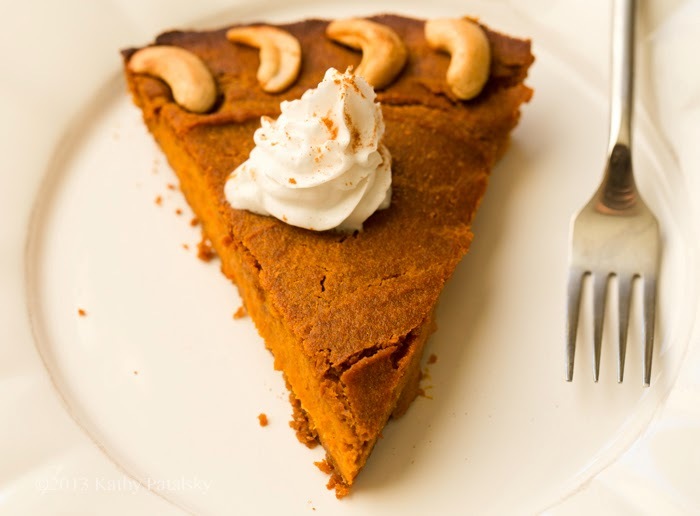 Maple + Spices + Pumpkin with a base of creamy cashews. 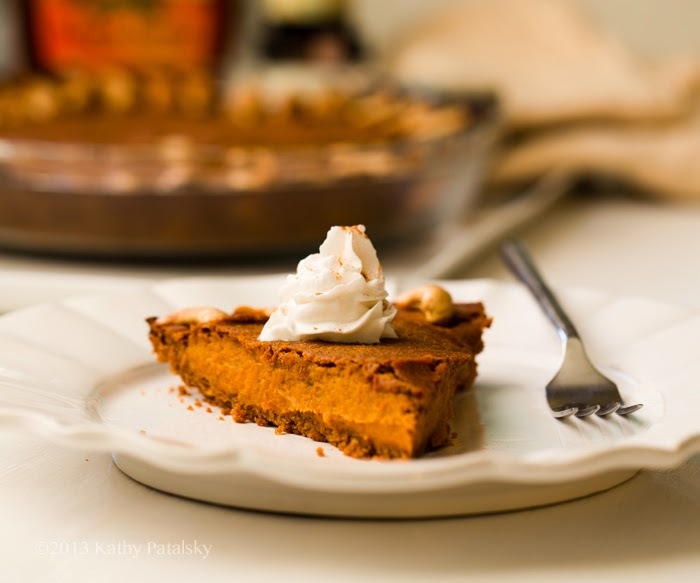 Now THAT is my perfect pumpkin pie. I actually admit that I over-baked this pie by about five-ten minutes. (Although no one seemed to notice but me.) But I know this because I put a second pie in the oven ten minutes after this one and it was a bit more moist on the inside, a lighter golden color while still retaining the caramel-colored maple-infused top coat. So watch those baking times. 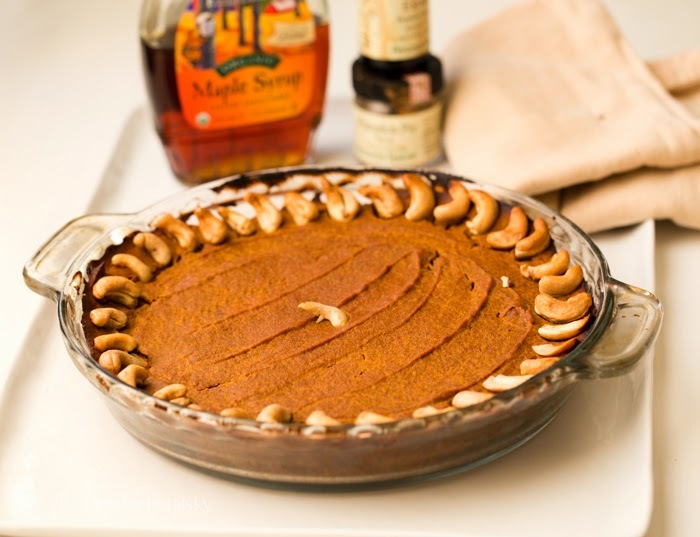 Over-baking a pie like this will still make for a delicious result (pretty fool proof recipe), but the texture is one to watch for. 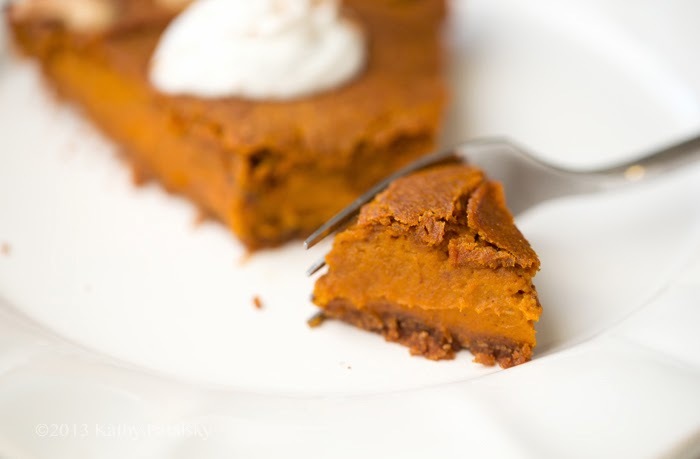 Actually some people like a drier vegan pumpkin pie! It almost turns into a baked cashew cheese-like texture. 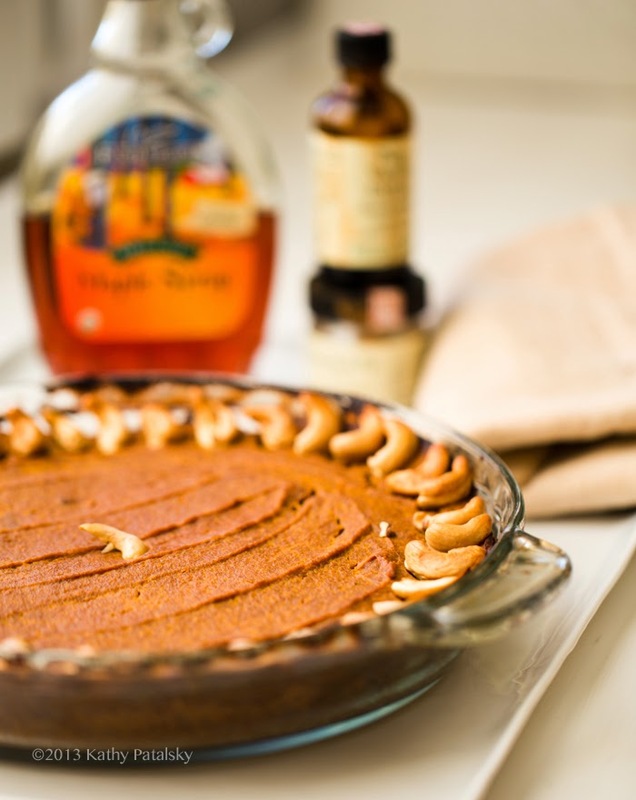 If you lose track of timing your pie, just pay attention to the browning. 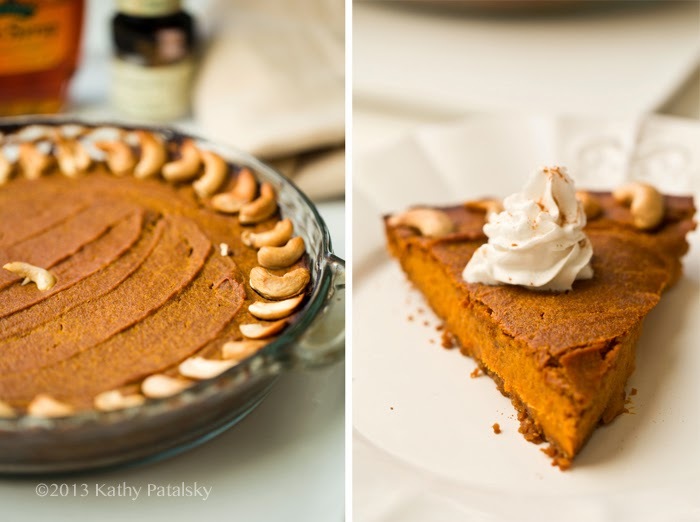 When those edges turn golden, the pie is close to done. Any very dark brown spots around the edges mean that it is well done. You can see this pie had a few dark edges. But still really amazing! Crust: you can use any crust you like. Gingersnap cookie. Crushed graham. Flour. 2. Prepare your crust, set aside. 3. 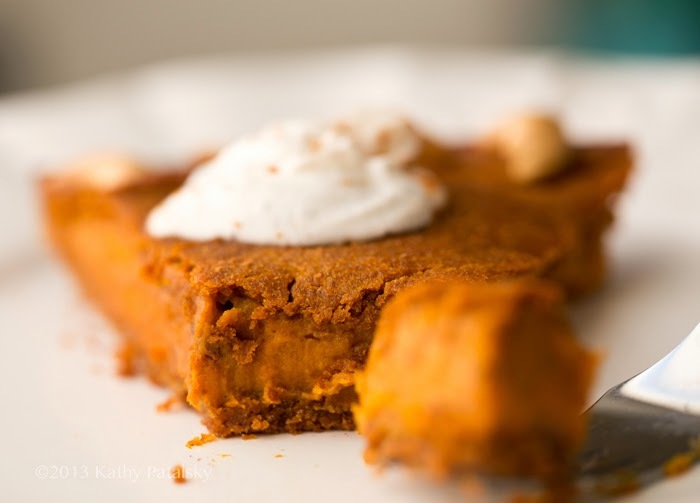 Add pumpkin, spice, vanilla, salt, oil and maple syrup to a blender or food processor. Blend until smooth. Then add int he cashews 1/4 cup at a time to ensure the blender can handle the thickness of the blend. You may need to stop between blends and scrape side of container. Blend until smooth. Troubleshooting: If you are having a rough time due to the power of your machine, add in 1/4 cup of non-dairy milk to loosen the blend. 4. Pour mixture into crust. Smooth out and add cashew ring design around edges. 5. Bake at 400 degrees for 15 minutes. Then reduce heat to 350 degrees and bake for an additional 25 minutes. 6. Cool on counter and place in fridge to harden up. Overnight is best, but at least three hours in the fridge for best texture results.